Experience. A bad experience can ruin you for life. You don’t believe me? Remember one of your parents calling you a name or acting displeased? What about a your first concert? How about the first time someone actually listened to your view, your talent or what you have to say. It meant something, it shaped you. Good or bad, you are the culmination of your experiences. The Bible is sometimes (most often) looked at as a law book rather than a reference to how God interacts with his creations. Scripture is the culmination of lives. So then scripture is a sum of experiences. A barren womb, a meek man becoming the voice of a people, rocks giving waters, bushes talking, dead carcasses yielding honey. You cannot find an absolute in this other than a personal God interacting with his beloved. So many times your story of faith will turn into an argument. The same people you are supposed to rejoice with about how God is relating and speaking to you becomes a defense. How god relates to you will be just that, no defense needed. Faith isn’t an argument, it’s a journey. Everyone is on a different path; faith in each person’s eyes will vary to their experience of how God interacts with them. Jesus would often walk among leprous people throughout the streets and according to the Talmudic law those around him yelled “unclean!” He not once had that same expression to the lepers. He was moved with compassion, he helped them and loved. Very rarely do I advertise another Author’s book, or do I feel the need to tell others to buy a book. 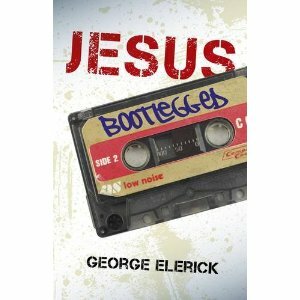 In his newest work Bootlegged Jesus, George Elerick has crafted what is soon to be a haven for those unsatisfied with Christianity, George points to the misfits and second class citizens Jesus chose to have build and finance his kingdom mission. George Elerick provides an intellectual and articulate foundation for a change in our emerging society. I think that everyone young, old, Christian, emerging will benefit and find gems of knowledge in this book. Articles from George can be found all over the internet as he is a featured contributor in many Christian magazines, websites and online blogs; he probes for discussion and acceptance rather than a voided truth and exclusive gospel. I will probably site some of his quotes and points later, but words could not express the discussion he begins in this book.